Adam is a Ph.D. candidate at the Missouri School of Journalism (he’ll be graduating soon, so you should hire him). 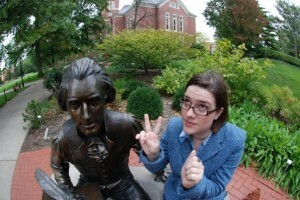 Before that, he worked at Ball State University (which is how he and Renée met … more on that later). Adam is originally from Indianapolis, and his brother Brian still lives there with his family. His mother, Mary, and his older brother, Joey, live in Eagan, Minn., a suburb of the Twin Cities. Adam’s father, Joe, passed away in December 2008. He would have really liked Renée. Adam will (hopefully) graduate in May or August 2012. Where that takes them, they’re not quite sure. Adam’s looking for jobs in the Baltimore/D.C. area, so that’s hopefully where they end up. Renée teaches journalism skills to military personnel at the Defense Information School. Before that, she also worked at Ball State, and before that, she worked in several newsrooms as a copy editor. Renée is from Richmond, Va., where her parents, Glenn and Gloria, live. Her sister, Stephanie, lives in State College, Pa., where she is working on her Ph.D. Adam and Stephanie are in a race to see who finishes first. (Stephanie’s field is a lot more science-y than Adam’s). So, how did these crazy kids meet? 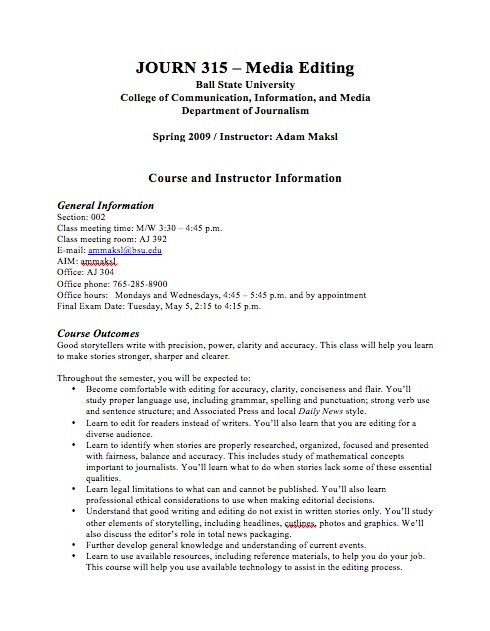 The JOURN 315 syllabus that brought us together. You see, Adam and Renée both worked for the journalism department at Ball State, but they didn’t work there at the same time. 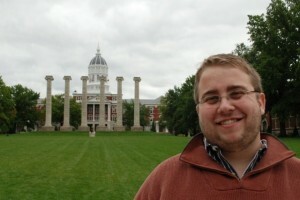 In early August 2009, Adam moved to Columbia, Mo., to start on his Ph.D. at Mizzou. About a week later, Renée was hired by Ball State. 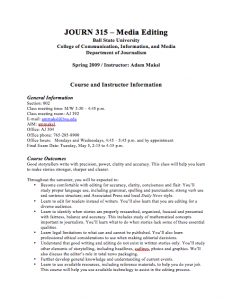 At Ball State, Adam was an adjunct faculty member, and among the courses he taught was copy-editing. Renée, having been a copy editor at newspapers, was assigned that course and given old syllabi, including Adam’s. Thinking that he still worked there, Renée emailed Adam asking to meet for coffee, and after he responded that he didn’t live in Muncie anymore, they decided to set up a video chat. They chatted for about 30 minutes about work topics — and about two hours about stuff.